This is a set of Mods you can combine to tune the Teppanyaki Grill to your your liking. Note: You MUST have the Chun Co. Teppanyaki Grill from the Sims 3 Store in order for this mod to work. It will NOT add the item to your game. These mods are compatible with patches 1.66 - 1.67. Again, this requires the Teppanyaki Grill Premium Content Item from the Sims 3 Store to be installed in your game, or it will do absolutely nothing. Are your sims spending too much time playing with their fancy new grill? This mod will prevent your sims from using the Teppanyaki Grill autonomously. 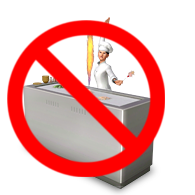 Your sims will neither cook with the Teppanyaki Grill, nor perform tricks autonomously. I do not currently know of any other mods that alter these resources, but I'm sure they will pop up. The Teppanyaki Grill has 10% chance to burn food. This mod sets the chance to 0%. This mod will conflict with any other mod that alters the XML tuning (Instance ID: 0x10EBFDFC77E22937) for the Teppanyaki Grill. Please report any problems that you encounter with these mods.